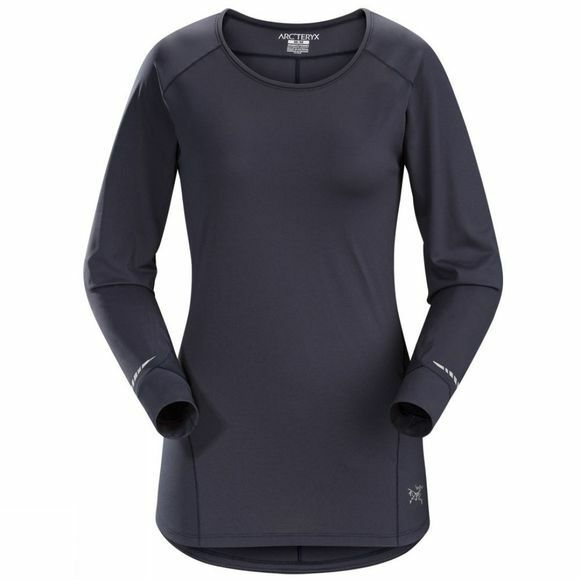 Thoughtfully designed for versatility and performance, the Women's Arc'teryx Motus LS Crew is made of Phasic™ SL, an advanced bi-component fabric that wicks moisture and dries quickly. Designed for high output mountain training, the Motus is anatomically patterned and has gusseted underarms for exceptional freedom of movement. The women’s specific trim fit moves with the body and keeps the fabric close to the skin to maximize wicking and performance. Reflective blades at the sleeves increase visibility in low light. Phasic™ SL, an innovative Arc’teryx next to skin fabric, is a key to the Motus’ performance. Phasic™ SL’s bi-component structure combines hydrophobic yarns with multi-dimensional Phi yarns to elevate the level of moisture dispersion. This regulates body temperature during active phases, and dries faster during rest phases. The knit construction’s mechanical stretch eliminates the need for elastic yarns that can retain moisture, but still allows the Motus to provide a performance fit that moves with the body. Materials: Phasic™ SL—70% polyester, 30% polypropylene, UPF 25, 98 g/m². Reduced yarn size of polypropylene lends soft touch to 100% hydrophobic jersey knit textile with mechanical stretch. Composed of multidimensional polyester yarns that wick moisture laterally to dry quickly. Very light weight with a smooth outer face that slides easily under other layers.